Four colorful nations race for control… and to become LEGENDS! At first glance, most of the changes between Eight-Minute Empire and Legends are fairly superficial. The maps, modular archipelagos of fantastic locales like autumnal forests, sand-swept deserts, idyllic hamlets in verdant green fields, and hauntingly vacant island-spanning cities, are nothing short of gorgeous — but are they really that much different from the parchment-map style of the original? At first they seem like more of the same, albeit with a fresh splash of paint. The little castle tokens that represent cities are cool and distinctive when set on the board, but aren’t they functionally the same as the old disc-cities? And isn’t the gameplay of the original, the selecting of cards in order to recruit armies, march across land or sail over seas, found cities, and wage war — not to mention amass a fortune of carrots and coal — basically identical? But it isn’t so, and bit by bit, Legends starts to win you over. First to pare back some of the jade that has come to encase your heart are the cards themselves. Gone are the bland commodity/action pairings of the original game, in lieu of a beautiful and individually illustrated set. What’s more, while each card still informs you of what action you get to take when you purchase it, the somewhat less compelling commodity-matching sub-game has been stripped out. Instead, each card offers a permanent upgrade for your (eight-minute) empire. That Arcane Manticore, for instance, not only lets you raise four armies and kill one of your opponent’s guys; it also means future moves are accompanied by an extra army. The Night Village does found a city, yes — but it also gives you an extra army in all subsequent recruitments. There are upgrades that let you earn victory points for matching sets of cards, flying upgrades for crossing oceans with ease, and even a punk named the Dire Giant who makes your armies immune to attack. Very cool. In Legends, that first half of each turn, in which you consider which of six increasingly expensive cards to purchase, is a little bit more agonizing than it was before. Where the first game saw you juggling two means of picking up points — controlled territory and matched commodities — Legends tosses a flaming torch, a steak knife, and a chainsaw into the air and hopes you’ll twirl them as gracefully as ever. Now you can get points from matching sets of cards, provided you’ve purchased the correct cards; or from holding the most elixirs at the end of the game; or, if you’re playing with all the variants mixed in, from slaying the dragon or conquering bonus citadels. Will you make the right choices and become a LEGEND? It might seem like a lot, but it really isn’t. The game is as simple as ever: purchase a card, take its action. Glare at your loved ones when they take the card you wanted. Laugh at their misfortunes. Wrap up a game in twenty minutes. Probably repeat. Legends even manages to streamline the precisely two things I didn’t love about Eight-Minute Empire. First, since relocating to another continent was one of the best ways to pick up points, and since you could only move by sea-lane when you purchased a “move by sea” card, the result was that unless the card offer was incredibly abundant with “move by sea” cards, they were usually gobbled up as quickly as possible, leaving some unlucky player with little to do but dominate the starting landmass. Which was pretty boring. Second, with the same “move by sea” weirdness in mind, if you went to the trouble of shipping a colonizing army over to a new continent, it was possible for someone to use the “destroy an army” action to ruin your day by killing your colonist and invalidating your entire previous action, with very little effort. Lame. Both of those issues have been rectified in Legends. Happily, there’s no more “move by sea” action; instead, crossing a sea-lane chews up three movement points. Now anyone can move across water, albeit slowly, and you can claim cards with a flying upgrade to make water movement even less costly. The “destroy an army” action has been improved as well, only letting you destroy an army in a territory you share, removing the horrid screw-you of the original action. A flying island, straight out of LEGEND! And really, that’s just scratching the surface of why I love Eight-Minute Empire: Legends. It’s basically the same as the original game, minus a few rough edges and the somewhat uninteresting commodity-matching, and plus an interesting upgrade system that adds loads of depth to its decision space, beautiful art, modular boards, and optional extras like exploration tokens that nudge players into exploring the farthest reaches of the map, point-generating citadels that become hotspots for conflict, and leader cards that confer new benefits and abilities. It’s as simple and elegant as ever, but with a little extra meat on its bones for filling up the stomachs of hardier gamers. Back in April, I assumed Eight-Minute Empire would be my filler game of 2013. I couldn’t have guessed its own sequel would steal that distinction. 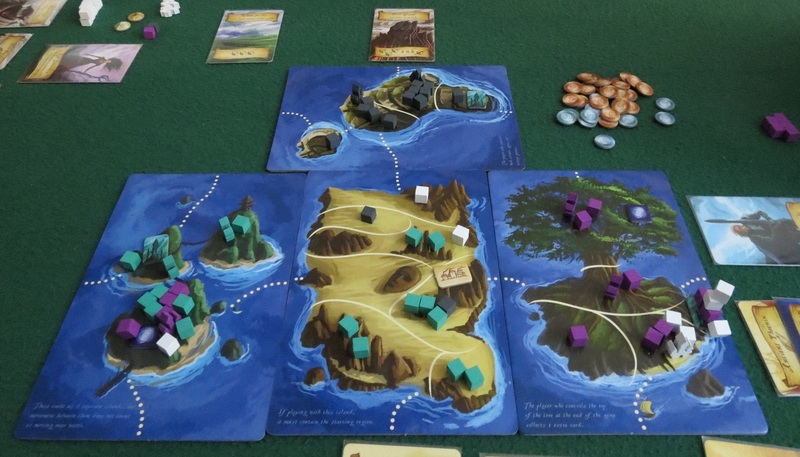 Posted on November 25, 2013, in Board Game and tagged Eight-Minute Empire, Eight-Minute Empire: Legends, Red Raven Games, Ryan Laukat, The Fruits of Kickstarter. Bookmark the permalink. 14 Comments. It was really fun and incredibly LEGENDARY to play! I think we’ll pull this one out more than the other, or maybe add in the extra rules to the original that smooth out the rough spots. I was in the camp that was worried that Legends would be a cynical cash-in, so I missed the KS campaign. So this is excellent news! I’ll be picking it up for sure. You’re such a jack. I was going to give this a pass because I’m still happy with vanilla 8ME, and now I want it. Thanks a lot. Splendid review, keep up the good work! I am loving this game more every time I play it. It looks,great, easy to teach, and plays quickly. Win/win/win. Pingback: Best Week 2013: The Appetizers | SPACE-BIFF! Pingback: Best Week 2013: The (Other) Games of the Year | SPACE-BIFF! 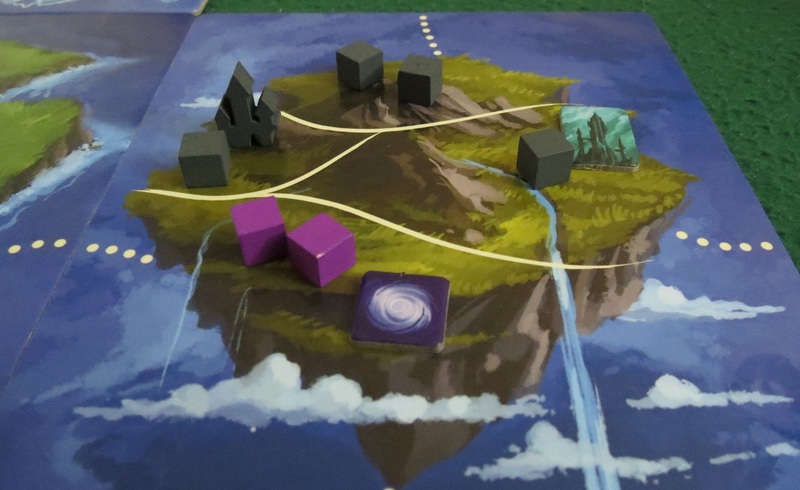 Pingback: Tiny Epic Something-or-Other | SPACE-BIFF! Pingback: The Ancients Had No Turnips | SPACE-BIFF! Pingback: Eighty-Minute Empire | SPACE-BIFF! Pingback: We’ll All Float On Okay | SPACE-BIFF!